We would like to run eslint from within Visual Studio and be able to double click on the reported issues. Actually, Visual Studio cares about the part up to the colon, the format of the message is arbitrary. Is this just visual studio or do other editors use this format too? Is it possible to configure Visual Studio to use a different format? As far as I know it is not possible to configure VS to recognize other formats. I do not know about other editors that use this same format. Can you point to any documentation about this format? Okay great, I think this will be a good addition. I am looking to get the errors from gulp-sass-lint/sass-lint in the eslint Visual Studio format to display in the error list in Visual Studio 2017 and the provided link about this format is broken and I can't find a solution anywhere. Could somebody explain how we should be expecting to use the eslint Visual Studio format in Visual Studio please? Hi @rileytb, it looks like you want to check out our Integrations page for more information. It looks like you can use Visual Studio Code with an ESLint extension. Not sure if that is easily adapted into Visual Studio itself, but hopefully you can start there and maybe find more precise documentation along the way. Thanks for the quick response. I personally have been using VSCode with ESLint and this works like a charm. However, because other people exist that haven't/won't convert, I would need results in VS too. 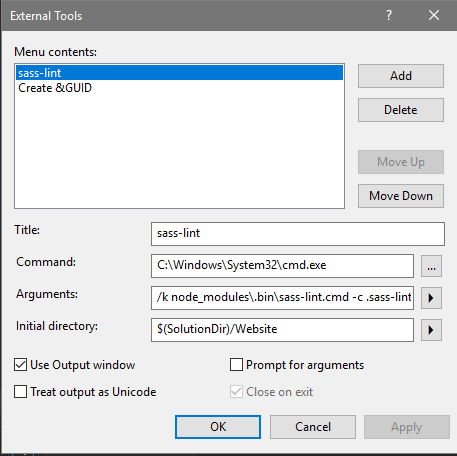 I have tried similar extensions in VS 2017, I just don't know what to do with my output of gulp-sass-lint -> eslint data so that it can be read in (file location, extension, etc.). And that's the documentation I can't find. Side note: Output to an HTML page is an ok reporting tool for now too for those using VS.
@rileytb In that case, sorry, I'm not sure. I would suggest stopping by our Gitter chat in case anyone there might know. We use this by adding an entry to the Tools/External Tools... UI that just runs eslint. The visualstudio formatter makes sure that we can double click the output. @rhpijnacker I have done (I think) as you explained, and it does work as an external tool where I can click it from the Tools menu to launch it, etc. However, the output from the command is listed as plain text in my Output tab, and nothing in Error List, nor is anything clickable. That looks like it’s running sass-lint, not eslint. All formatters have been brought across from eslint and modified slightly to fit the sass-lint package. Please direct issues to sass-lint team from v2 onwards as we no longer directly depend on eslint for our formatters. I guess me assuming that it would work the same as eslint is my fault. Please direct issues to sass-lint team from v2 onwards as we no longer directly depend on eslint for our formatters. It seems like you should open an issue on their repository, since they maintain the formatters separately. Well, shoot. I feel silly. Thanks for bringing that to my attention. I will follow up with them.